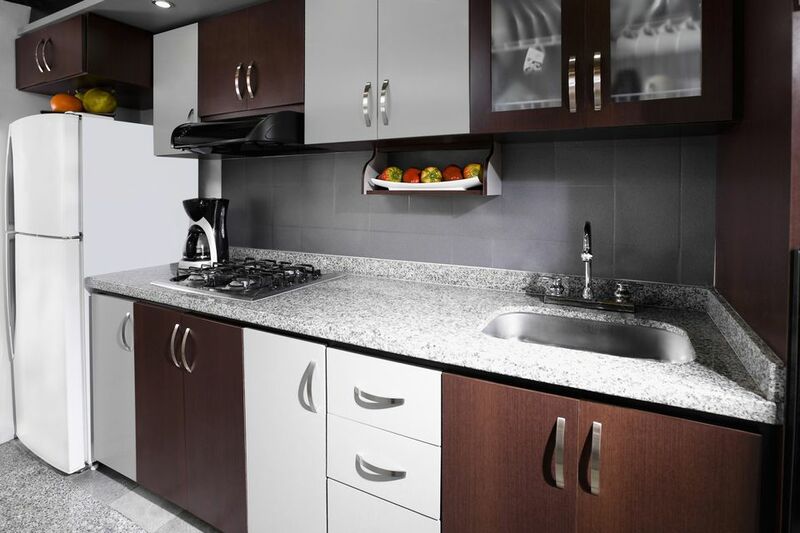 A kitchen sink base cabinet is essentially a modified standard base cabinet without any shelves or drawers. As a result, this is one of the most simple units to build. A false front on the top of the face of the carcase is installed instead of a drawer because of the sink dropping down into the cabinet from the countertop. Once the cabinet is finished and installed, a set of cabinet doors can be built, finished and mounted onto the face frame. Building this unit requires just over half of a standard 4x8 sheet of sanded pine or birch plywood, a 23-1/4 inch by 30-3/4 inch piece of 1/4-inch thick plywood for the cabinet back to give the unit structural integrity and a piece of 1x6 cut to 23-1/4 inches in length for the false drawer front. An adventurous soul might try to build a tilt-out drawer in place of the false front for storing small sink-related items like sponges and steel wool, but the false drawer front is the standard method for building a sink cabinet. As far as tools and equipment are concerned, for this project, you'll need a table saw with a large table, a stacked dado blade set, a circular saw or jig saw, a finish nailer with 1-1/4 inch finish nails, a combination square, and some wood glue. The first step is to cut the two side panels. Set your table saw fence to 35-1/4 inches away from the near side of the saw blade. Raise the blade to about an inch, then place a full 4x8 sheet of plywood flat on the table with one of the 4-foot sides against the fence. Turn on the saw and ease the plywood through the blade, maintaining consistently even contact between the edge of the plywood and the fence. Once the cut is completed, pull the remaining plywood off of the table and set it aside for the moment. Adjust your table saw blade to 24 inches and cut the 4-foot side of the 35-1/4 inch piece of plywood in half. You should end up with two even pieces of plywood measuring 35-1/4 inches by 24 inches. These pieces will be the sides of your cabinet, which you should set aside for the moment. Adjust the table saw fence to 23-1/4 inches from the near side of the blade, then place the remaining cut off section of plywood flat on the saw table with the 4-foot side against the fence. Rip the plywood and once again, set the cut off section aside, as you won't be needing the rest of this piece of plywood for this project. Reset the fence to 24 inches, place the short side of the piece you just ripped against the fence and cut the plywood. This should yield two pieces measuring 23-1/4 inches by 24 inches. One of these pieces will serve as the cabinet bottom, so set it aside with the two cabinet sides. Out of your remaining scraps of 3/4-inch plywood, cut two pieces measuring 4-inches square. Cut these two pieces diagonally to make four right triangle sections that are 4-inches on each of the short sides to act as corner blocks in support of the countertop and sink. Pull out the two cabinet sides and place them on a shop table. Using a combination square, measure up from the 24-inch wide bottom edge on one of the cabinets four inches, and place a pencil mark at that height 3-inches in from the front edge of the cabinet. Align the combination square against the bottom of the plywood and scribe a line from the bottom up to that mark, then reposition the square against the front edge 4-inches from the bottom and scribe a second line from the first line out to the front edge. This will mark a 4-inch tall by 3-inch deep cutout for your toe kick. Mark the second piece of plywood, then cut the two toe kick cutouts using a circular saw or a jigsaw. Install a stacked dado blade set into on your table saw arbor with the correct number of chippers so that the blade set matches the thickness of your plywood (typically 23/32-inches). You could also use a radial arm saw for this task. Raise the blade to 3/8-inch above the surface of the saw table. Adjust the fence so that the near side of the blade is 4-inches from the fence, then place one of the cabinet sides flat on the table with the bottom edge (adjacent to the toe kick cutout) against the fence. Turn on the saw and cut a dado for the cabinet bottom 4-inches up from the bottom of the cabinet. Repeat with the other cabinet side, making sure that you dado the two edges that will face the center of the cabinet opening. Adjust the fence to 23-3/4 inches away from the nearest side of the saw blade, and cut a rabbet on the inner face of the back edge of each side panel to accommodate the plywood back. Time for some assembly. Place the left side of the cabinet onto the work table with the dado facing upward, and put a bead of glue into the dado. You may wish to spread the glue with a brush across all surfaces of the dado for even distribution. Insert the 23-1/4 inch wide edge of the cabinet bottom into the dado, with the front of the bottom flush with the front edge of the cabinet side. Flip the assembly onto its side and drive a few finish nails through the side into the cabinet bottom to hold the bottom in place while the glue dries. Then, put glue into the dado on the other cabinet side, insert the cabinet bottom and attach the opposite side to the bottom with finish nails. Next, attach the 1/4-inch plywood back by slipping it into the two rabbets on the back edge of the cabinet. The top of the backer should align with the tops of the two cabinet sides evenly, so rack the assembly if the pieces don't match up perfectly. Attach the plywood back with finish nails into the sides and cabinet bottom. Place the rear nailer along the inside edge of the plywood back, with the 3-inch tall face flush with the cabinet backer. Attach this piece with finish nails through the cabinet sides, but no glue. Do the same for the cabinet face board on the front edge and the toe kick on the front edges of the sides just beneath the cabinet bottom. Position a corner block in the front left corner of the cabinet, with one 4-inch side against the side of the cabinet and the other 4-inch side against the inner face of the face board, and tack the corner block into place. Repeat with the other three corner blocks. The final step before installation is to tack the false drawer front onto the face of the cabinet. You will want this false front to have routered edges to match any doors or drawers you use in the rest of the kitchen cabinets. Center the false front on the face and attach it with finish nails from the inside of the cabinet through the face board. To install the cabinet, cut holes in the plywood backer to accommodate any plumbing, then slide the cabinet into place flush against the wall. Use a stud finder to locate any wall studs, then attach the cabinet to the wall with screws through the nailer block along the top back edge of the cabinet.